On Sale Now! Free Shipping Included! 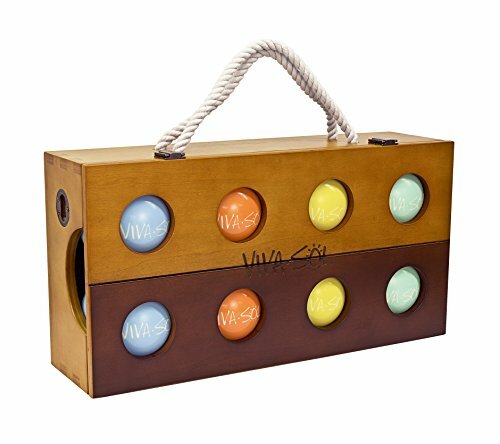 Save 4% on the Viva Sol Premium Bocce Ball Set with Wooden Case by Viva Sol at Scruffs Game. MPN: VS1000. Hurry! Limited time offer. Offer valid only while supplies last. The Viva Sol Resin Bocce Set contains everything you need to enjoy a blood-pounding game of bocce – except for some formidable opponents, that is. The Viva Sol Resin Bocce Set contains everything you need to enjoy a blood-pounding game of bocce – except for some formidable opponents, that is. Eight regulation-sized bocce balls and a pallino are all included in this set. Each ball is made from professional-grade resin, buffed smooth and engraved with the “Viva Sol” logo. The pallino is a creamy white while the bocce balls come in bright solid blue, orange, yellow, and green. A beautiful oil-rubbed, solid wood case provides a handy storage area for the set. Bronze hardware and a rope carry handle outfit the case, making transportation a breeze.